Sorry for my absence these last few days, only I had an operation on Wednesday and my face is swollen, my jaw is aching like a good un, even my tongue is bruised, so I haven't felt up to much! I'm sorry for my lack of comments too, I have so gotten behind with everything! It's a long story that I won't bore you all with in detail, but I had a tooth infection start, about three years ago and I had antibiotics prescribed, which didn't do the trick, and subsequently I had three root canals, none of which worked! Today I decided to use something from my enormous collection of NBUS . . . I have also decided that I must stay away from all the new releases until I have used more of my NBUS. It will be difficult, but I thought if I write something down that I fancy getting and then leave it for a while, if I still want it when I look at it again, in say, a month, then I will get it. 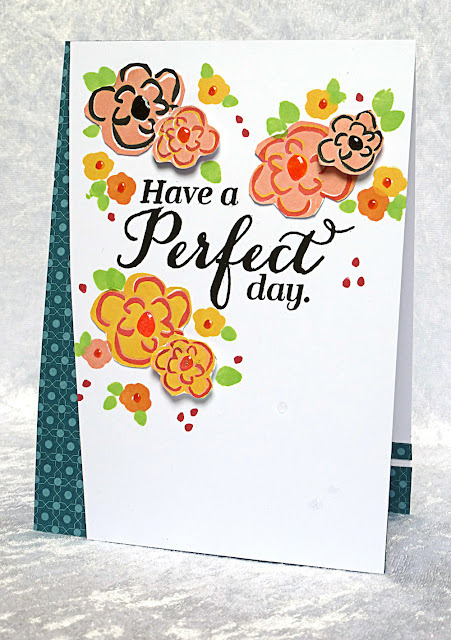 What usually happens with me is, I see a fabulous card made with a new release and think that I need to get that stamp set/die etc., and when it arrives, I put it to one side, then later, when I see it in my stack, I can't think what I can do with it! Are any of you the same, or do you use your new stuff as it arrives? So, my mantra is going to be, use more and buy less . . . Hmm, I wonder how long that will last? 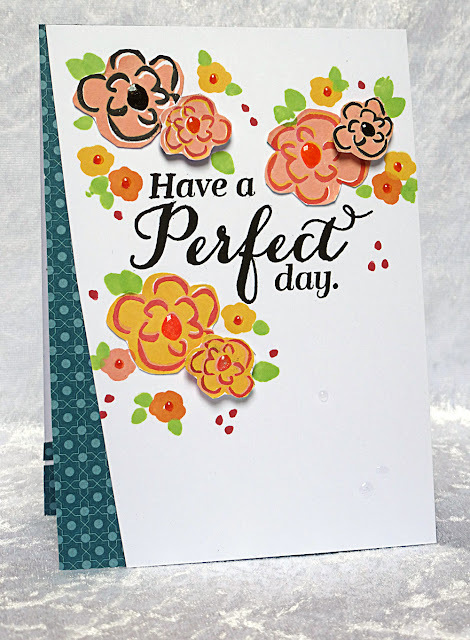 Anywho, on to today's card, it was made with my, Waffle Flower 'Perfect' stamp set. Not one of my best attempts I know, but they can't all be perfect, can they? I must hold my hands up and say that I have never been very good at flower arranging, real or virtual! Smashing make! So very sorry to hear of your ongoing saga and hope you will soon be on the mend - with the help of both Ben and Jerry, of course! I'm so sorry to hear about your mouth problems and and hope you are recovering well from the operation. It must be so uncomfortable but I hope the guilt free frozen yogurt is some compensation. You could be speaking about me with regard to not using my NBUS but still buying more! What are we like! I love the way you put yours to such good use with this lovely card. I really like the colours you chose and the design is beautiful. Oh my goodness I dread going to the dentist and your situation had really gone worse. Hope you heal up soon. I am sure making cards is a good healing process for you, especially when they are so pretty ! There is nothing worse than dental problems, Hazel. I do hope you're on the mend, or nearing the end at last. Glad to have you back - and about the buying/not using? we all have been there/done that!!! Your flowers are arranged in a very sweet way, on a very sweet and darling card! Oh dear, oh dear, Hazel, I feel so sorry for you. I hope you may get well SOON my friend. And hopefully you're not too much in pain ? Thinking of you my friend and i love your card and flower arrangment. I am so sorry for all that you have gone through lately, Hazel. 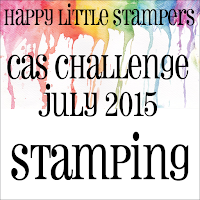 That you are cardmaking and blogging AT ALL shows your strength and determination. I'm sending you many, many virtual good wishes for quick healing and the return of your energy. Your card today is lovely. I think you arranged those flowers perfectly, and it is so bright and cheerful. Love it! You poor thing! I hope that the operation did the trick and you will feel better soon! I am definitely the same as you! Even though I have more than enough stuff I keep buying things (why do they keep coming out with irresistible stuff???) and when it arrives I put it on Mt. NBUS and then it takes me forever to use it. By the time I do, I have forgotten what inspired me. So you are not alone! Your card is very pretty! I admire you for crafting when you don't feel so well! I think this is beautiful! The colors are vibrant and the sentiment is bold - both a good combination to my eye! As for buying new stuff sometimes, like you, I buy things because I've seen something made with them that I like then when I get it I put it aside and then can't remember what it was that I was supposed to do with it. I like your idea of writing down what it is that I THINK I want and then checking back a while later to see if I still NEED it. Only think of the money I will save!! Absolutely gorgeous card Hazel, simply gorgeous! You would never know from the looks of your amazing card that you will under the weather. Sending well wishes to you, no fun at all. I worked in the dental field for over 20 years so I know just what you are talking about. Take it easy and I do believe that shopping new releases will make your mouth feel better, lots better! Oh Hazel, you poor thing, sounds like you've had a nightmare of a time. I once had an operation on my jaw joint so I know how awful any operation is that involves your face or head, you just feel bleurghhh :( My advice, buy Ben and Jerry's in every flavour and go for it! I need to follow your lead with buying new stash. I've got so much that I haven't yet used to last me a lifetime. I too have decided to keep a book of lists of products I like and where I saw them and really need to stop just buying all the time, it's getting ridiculous but it's all so preeeetttyy! I'm not the best with flowers either and my floral cards cause me a lot of stress before they are finished. I think you did a fantastic job and you certainly can't see your frustration in the arrangement. 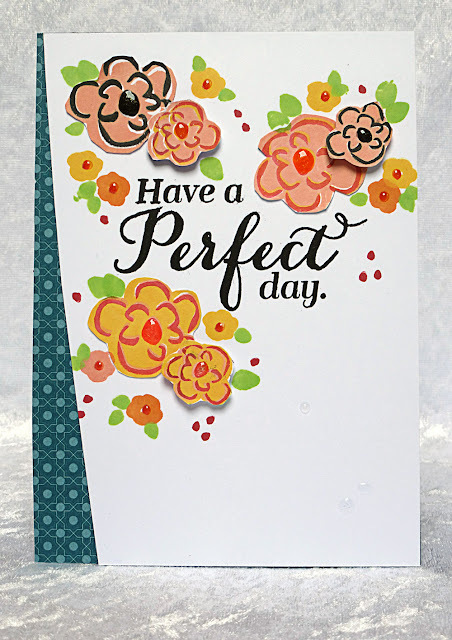 Its beautifully stamped and fussy cut and love the patterned paper you paired with it. So sorry to hear about your tooth troubles. Having had problems with my teeth since I was a baby, I so know how you feel. Its so painful (not only physically but on the wallet too....) and I hope you have someone looking after you. Thank goodness for ice cream!!! Oh, my, Hazel - so sorry to hear about the op!!!! Hope you are feeling better by this time!!! And enjoy that frozen yoghurt, hey!!! Not buying any more new things - I also decided to do that, until I visited the MFT shop again and I couldn't keep myself in!!! But I have to say that over the last year I have been very good at not buying everything I can lay my hands on!!!! Especially when it comes to scrapbook paper I went overboard totally in the past, but not any more!!!! I love your idea to write everything down and then have a look at it at a later stage and only then decide on getting it or leaving it. Very clever!!! Your card is soooo beautiful, Hazel!!! Definately nothing wrong with your stunning arrangement of flowers!!! I love the angled panel with the lovely piece of patterned paper underneath and the colours are so lovely!!!! Love all the red dots you've added!!!! The sentiment fits so beautifully between all the lovely flowers!!!! This is really beautiful, Hazel!!!!! I am the same way, Hazel! I need to stop buying new stuff since I can't seem to remember what to do with it when I get around to using it! So sorry about your tooth trouble. I've had some of that myself and I know how unpleasant it is. Ice cream does help! 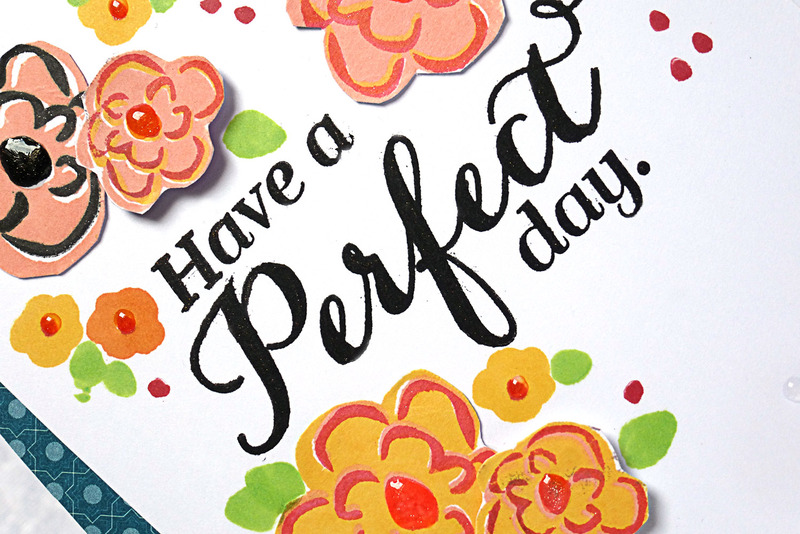 Love your bright and pretty card! Hope you've feeling much better by now, my friend!